Students are calling for Prince Philip to be removed from his post as chancellor of Edinburgh University. The Edinburgh University Students' Association (EUSA) plans to ask the Duke of Edinburgh to stand aside. The student body backed a motion which said the position "might as well be filled by a piece of root ginger". However, the university said the vote would have "no bearing" on the Duke's position, which its rules say he will hold for life. About 800 students attended the student association's annual meeting on Wednesday evening. 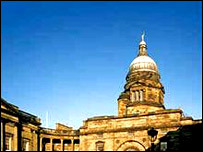 The motion was proposed by 22-year-old student Jeremy Kemp. It also stated: "HRH Prince Philip is not a suitable figurehead or representative of the university." Mr Kemp said: "I am very happy but there is still a lot of work to do. "It is still possible for the university and Philip to ignore the will of 20,000 students. "But I am fairly optimistic he will take heed and we can change the constitution and allow for elections." The EUSA, an amalgamation of the students' union and the Students' Representative Council, will now lobby for the university to ask Prince Philip to resign. The student association's president, Will Garton, will also write to the Duke asking him to relinquish the post. However, university secretary Melvyn Cornish said that the vote represented less than 5% of the total student population. "I am rather doubtful that it reflects the general feeling on campus," he said. "What we do know is that the vote has no bearing on the constitutional position. 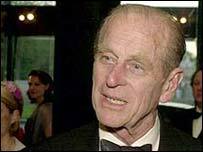 "The Duke of Edinburgh remains the university's chancellor." He said Prince Philip worked "extensively" as an ambassador for the university. "We very much value his continued engagement with the university despite his many other commitments," he said. The university's principal and vice-chancellor, Professor Timothy O'Shea, also voiced his support. "The Duke of Edinburgh has held the position of chancellor for over 50 years and, in that time, he has worked resolutely on behalf of the staff and students here," he said. "Only last month, for example, he hosted a dinner to announce plans to develop a £40m facility which will help maintain the university's leading role in the emerging disciplines of informatics and e-science. "He takes an active interest in all aspects of university life, and he continues to generate an enormous amount of goodwill for the university both at home and abroad." Prince Philip was elected chancellor by the University General Council in 1952.